- Lola Martinez returned to CNN International this week. A former weather anchor for the network, Lola has been a freelancer since 2009. She will present weather bulletins across the CNNI schedule for around a month. - Natalie Allen returned to anchor duties on CNN International this week. She had been off air for almost six weeks. - CNN wins three Gracie awards. - CNN International breached U.K. broadcast rules. - How valuable is CNN to cable operators? - CNN tops poll of "most trusted" for racial and cultural issues. - CNN International launches new monthly feature series, "Earth's Frontiers"
Earlier this week we learned that The Daily Show - Global Edition was no longer being aired on CNNI. We'd like to know what you think. CNN Press Release - A magnitude 8.8 earthquake strikes central Chile. The full extent of the damage is not yet known although there are reports of collapsed buildings and hundreds of people in the streets. MORE AT CNN.COM. CNN Chile is a joint-venture between CNN and Liberty Global's VTR, CNN Chile launched in December 2008. In addition to a fully staffed local news production center based in Santiago, CNN Chile has complete access to CNN Worldwide’s newsgathering resources including the support of 4,000 journalists based around the globe. Live Report from CNN Chile President Rolando Santos: click here. CNN Press Release - Victor Kong, an executive with a range of multi-media experience, will lead CNN Radio as vice president, it was announced today by Susan Grant, executive vice president of CNN News Services, a division of CNN Worldwide which encompasses the company’s digital and affiliate businesses. Kong will manage CNN Radio in developing new audiences, partnerships, and content for digital platforms, and continue providing the best original audio news content to CNN’s terrestrial radio affiliates. He will be based in CNN’s Atlanta offices and will report to Grant. Prior to joining CNN, Kong was executive vice president, sales and business development at Hoodiny; previously, Kong served as vice president at MySpace Latin America, where he also served as managing director since 2007, starting the company in Latin America, launching the mobile business, initiating aggressive viral marketing campaigns and producing numerous community-building events. Previously, he was vice president of growth strategy and new media sales and business development for MTV Networks Latin America. Kong joined Terra Networks 2001 and ultimately led the company’s Ecommerce activity in the USA, Spain and Latin America. In addition, his career includes working abroad and in the financial sector with positions at McKinsey & Company in Miami, Booz Allen & Hamilton in Buenos Aires, Argentina, and Banco Surinvest S.A. and Citibank Uruguay S.A. in Montevideo, Uruguay. Kong earned a bachelor of arts degree with distinction in economics and international relations from Stanford University and a masters of business administration with honors from the University of Chicago, Graduate School of Business. - Breaking: Personal Finance Editor Gerri Willis is leaving the network next Friday. Willis came to the network in 2003 and hosted both Open House and Your Bottom Line shows for the network, as well as reporting on pressing financial issues related to your job, home and debt. - CNNI World Report Anchor Rosemary Church launched a new Facebook profile this week. - Sarah Palin. CNN. Subpoena. - Christiane Amanpour to deliver Senior Class Day address to Harvard College grads. - Anderson Cooper slapped with lawsuit; and wins an award. - Sara Sidner, New Dehli-based International Correspondent, co-anchored American Morning with John Roberts on CNN Domestic on Thursday and Friday. - CNN International's new sponsor. This week's poll is about the CNN Worldwide networks. We'd like to know which CNN network you watch the most. With constituents giving Congress one of its lowest approval ratings ever and politicians throwing in the towel, the issue increasingly uniting the right, left and middle is that the government is not working the way it should. Beginning Monday, Feb. 22, CNN launches Broken Government, a multi-platform initiative to report in-depth on how the current environment in Washington as well as state capitals and small towns is disappointing and enraging many Americans and what solutions are being proposed to fix it. As with the Stimulus Report, CNN will air several segments per hour from American Morning through Anderson Cooper 360°, culminating in an hour-long special hosted by Jack Cafferty at 7p.m. Friday, Feb. 26 titled Broken Government: A Cafferty File Special Report. Throughout the week CNN correspondents and contributors will file in-depth reports from around the country on issues including the debate over government spending, congressional gridlock, outrageous medical expenses, Wall Street bonuses, the disappearing middle class, and the rise of Independents as partisan extremism grows. CNN will bring its contributors and experts together--including TIME magazine correspondents--to offer diverse perspectives and analysis on these issues. The CNN documentary was fronted by CNN’s Bangkok-based correspondent Dan Rivers and produced by Kit Swartz, Kocha Olarn and Theerasak Nitipiched. The award will be presented to Rivers on Thursday, April 8 at a luncheon in New York City. “To receive another prestigious award for this documentary is a tremendous reflection of the quality and depth of CNN’s reporting and the tenacity and resourcefulness of Dan Rivers,” said Tony Maddox, executive vice president and managing director of CNN International. Rivers traveled to parts of Indonesia and remote islands off the west coast of Thailand, where he uncovered shocking photos showing the Rohingya boat refugees being taken out to sea and abandoned by Thai military. Following a government inquiry, Thai Prime Minister Abhisit Vejjajiva admitted these practices to Rivers in an exclusive interview and said he would bring those responsible to account. This is the second award for World’s Untold Stories: A Forgotten People. In 2009, the Amnesty International UK Media Awards honored the documentary in the ‘International Television & Radio’ category for, as jurors stated, not only breaking new ground in the investigation, but also securing a personal commitment from the Thai prime minister to intervene. One month after the devastating Haiti earthquake, CNN correspondents look back, look ahead, and share their unique personal stories of covering a catastrophe. In Witness to Disaster, Anderson Cooper, Sanjay Gupta, Jonathan Mann, Karl Penhaul, Ivan Watson and others share the most memorable moments they experienced while reporting from Haiti. What were the most compelling stories they covered? Who were some of the unforgettable people they met? How did this disaster compare to others they've witnessed? They also tell us of the challenges that lie ahead – how are the people doing, one month on? How long will it take them to rebuild their lives? And what will become of them, once the world's attention starts to drift away? Witness to Disaster premieres on CNN International on Saturday, 20 Feb at 1230 ET / 1730 GMT / 1830 CET. CNN will air a two-hour production, We Were Warned: Cyber Shockwave, based upon exclusive television access to a national security cyber “war game” scenario. The simulated event was developed by The Bipartisan Policy Center and will debut Saturday, Feb. 20 and Sunday, Feb. 21 at 8pm, 11pm and 2am ET on CNN. The scenario was created by Fmr. CIA Director, General Michael Hayden (ret.) as well as the co-chairs of the 9/11 Commission, Fmr. Rep. Lee Hamilton (D-IN) and Fmr. Gov. Thomas Kean (R-NJ). CNN homeland security correspondent Jeanne Meserve reported from the live event for CNN on Tuesday, Feb. 16. CNN anchor Wolf Blitzer moderated a Q&A with the participants before a live audience that will air as part of the television special. Additional participants who served various roles for the scenario are: Fmr. U.S. Secretary of Homeland Security Michael Chertoff, Fmr. Director of National Intelligence John Negroponte, Fmr. White House Homeland Security Advisor and CNN contributor Fran Townsend, Fmr. Director of Central Intelligence John McLaughlin, Fmr. U.S. Senator Bennett Johnston, Jr. (D-LA), Fmr. National Economic Council Director Stephen Friedman, Fmr. U.S. Deputy Attorney General Jamie Gorelick, Fmr. White House Press Secretary Joe Lockhart, Fmr. National Security Agency General Counsel Stewart Baker, and Gen. Charles Wald, USAF (Ret. ), former Deputy Commander of the United States European Command. The unrehearsed event simulated a real-time White House Situation Room response to a massive cyber attack. Participants received simulated intelligence and news reports that required their rapid, informed advice for a U.S. president. We Were Warned: Cyber Shockwave is a CNN Production special event executive produced by Bud Bultman. The simulated exercise was produced by Chris Wayne & Associates, Minassian Media and Future View, Inc., for the Bipartisan Policy Center. The scenario was filmed before a live audience at the Mandarin Oriental Hotel in Washington, D.C. Scott Matthews is director of programming for CNN Productions, including the award-winning documentary series CNN Presents and the CNN Special Investigations Unit. 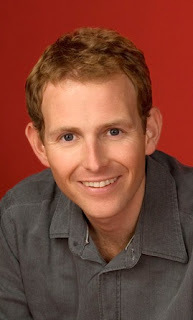 David Bohrman is the executive-in-charge of the special production. To make it easier to find your favorite CNN Anchor, Correspondent or Show on Twitter, we've created a list of the official CNN Twitter accounts. You can now find it to the right of this page right above the "Tip" box. If you've find anything we may have missed, please let us know. We'll do our best to keep this list updated as often as possible. - The New CNNMexico.com launches on Monday. - Governor T.J. Holmes? CNN's weekend anchor reveals a possible move into politics after he's done with journalism. - CNN's trial separation from AP. - Anderson Cooper to deliver Reagan Forum talk. - CNN International's Hala Gorani interviewed on French radio (video). - Anderson Cooper and Dr. Sanjay Gupta returned to Haiti this week to continue reporting on the relief efforts from the devastating January 12 earthquake. International Correspondent David McKenzie heads to Haiti after spending a week at CNN Center. He replaces John Vause. - CNN's moves to shift ratings. This week's poll is about CNN's coverage in Haiti. As mentioned previously, CNN's Anderson Cooper and Chief Medical Correspondent Dr. Sanjay Gupta returned to Haiti earlier this week. We'd like to know what you think. Tom Bettag joins CNN Worldwide as senior executive producer of State of the Union with Candy Crowley and Reliable Sources, it was announced today by David Bohrman, SVP of Programming and Washington bureau chief. Bettag will oversee the Sunday public affairs programming lineup, effective immediately. Since launching one year ago, State of the Union has cemented its reputation as the place to hear the voices of everyday Americans, informed experts and A-list politicians. Candy Crowley took over the anchor chair earlier this month and will continue to work with her stellar team to craft a show that is relevant, interesting and informative. In Bettag’s more than four decades in journalism, he has served as executive producer of CBS Evening News with Dan Rather, of ABC’s Nightline with Ted Koppel and of Koppel on Discovery on the Discovery Channel. Throughout his career he has earned six duPont-Columbia University Silver Baton Awards, three Overseas Press Club Awards and 30 Emmy Awards. In 2004, Bettag was honored with Quinnipiac University’s Fred Friendly Award, which recognizes those who have shown courage and forthrightness in preserving the rights of the First Amendment. Bettag earned a bachelor’s degree from the University of Notre Dame and a graduate degree from Columbia University’s School of Journalism. - Former CNN.com/Live anchor, Nicole Lapin, made her CNBC debut this week. Lapin co-anchors CNBC's Worldwide Exchange. - CNN launches new mobile service in Sri Lanka. - TV Newser is the first to report of HLN's Showbiz Tonight moving to 5pm. - CNN International nominated for "News Channel of the Year" in Britain. - Stephanie Elam and Christine Romans are pregnant. - Sasha Herriman, CNN International's London-based anchor and reporter, returned from maternity leave this week. - Bob Schieffer, host of CBS' Face The Nation, tells Politico.com of Candy Crowley's recent promotion, "This is really a long-deserved recognition. She's really good, and it means we have to work harder." - And finally - something from the archive: Do you think you're Ralitsa Vassileva? Each week in this space, you'll see our new Weekly Observations Poll, something directly related to CNN in the previous week. Our first poll is related to Candy Crowley and her new position as anchor of CNN's State Of The Union show. CNN Press Release - CNN’s new monthly series i-List takes you to countries that are changing the way we live and look at the world around us. The i-List will highlight innovation and influence in industry, business, technology, culture and more. It showcases a nation’s people and places – those having an impact inside and outside their borders. From 8th February, CNN International turns its cameras on France in i-List: France, a special week of prime time programming and reports from the country that will uncover some of the economic, social, cultural and political developments currently shaping France and positioning the nation for the future. Throughout 2010, i-List is set to come from a number of Asian countries. Mike McCarthy, CNN International’s Vice President of coverage and feature programming commented: “With i-List, we wanted to give our viewers and users insightful and intelligent programming about countries that are changing the way we think and how we live in an Interconnected world. “It will highlight the inventive people, innovative businesses and inspirational cultural trends in nations that directly impact the way we live and do business in the future. “We are delighted to launch our showpiece series in France. It’s a country that fascinates and intrigues our audience and we are looking forward to a week of compelling programming”. CNN will anchor two of its signature European prime time shows from France. Hala Gorani will be in Paris with ‘I-Desk’ and Fionnuala Sweeney in Lyon with ‘World One’. As well there will be a series of specially commissioned reports by correspondents Jim Bittermann and Atika Schubert. CNN’s Paris-based Senior Correspondent Jim Bittermann – recently awarded the Legion of Honour for his 30 years of distinguished reporting on France – examines how France is leveraging long established ties with China and India through the entrepreneurial spirit of business leaders such as the legendary Pierre Cardin, former French Prime Minister and Senator Pierre Rafferin and inspirational Club Med chairman Henri Giscard d’Estaing. Atika Shubert begins our week at the Lyon Library which has joined up with Google Books to post 500,000 ancient manuscripts online. French officials fear that the scanning project by Google will put the country's national literary treasures in the control of corporate hands. Lyon's Library Director shows CNN the rare document he believes need to be scanned by Google. Atika Shubert then travels to Marseilles – the nation’s third largest city, a standard bearer for cultural integration and set to be Europe’s Capital of Culture in 2013. Two Islamic leaders give viewers an insight into the “Muslim Marseilles” in a report that highlights how immigration and integration in the city can set an example, not just for other French cities, but for cities beyond its borders. The high energy rappers Fonky Family offer an intriguing insight into what the accolade “Capital of Culture” could mean for the future of this historical port city in 2013 and a day spent with the superstars of the Olympic Marseilles explains what makes this Mediterranean city so special for football fans around France. The special week of coverage will culminate with a 30 minute debate hosted by CNN’s Hala Gorani with a panel of French personalities including Areva CEO Anne Lauvergeon. Online users will be able to visit the i-List microsite, www.cnn.com/ilist for video packages and more. In January, CNN topped MSNBC during daytime (9am-5pm), total day (6am-6am) and in weekday primetime (8-11pm) in both total viewers and in the key demo adults 25-54. In head-to-head comparisons with MSNBC’s daytime non-opinion news programming – CNN dominated, averaging 658k vs. 305k in total viewers (+116%), and 165k vs. 75k in adults 25-54 (+120%). MSNBC placed either fourth or fifth (trailing behind CNBC) every weekday hour throughout the day (9 am until 5 pm) in the key demo 25-54. At 5pm, Hardball slipped to fourth place behind FNC, CNN’s Situation Room with Wolf Blitzer and HLN’s Prime News among adults 25-54, and also placed fourth at 7 pm, trailing FNC, CNN and HLN’s Issues with Jane Velez-Mitchell. CNN also outperformed MSNBC in total day (6am-6am) in both total viewers (577k vs. 369k) and among adults 25-54 (177k vs. 122k). And HLN topped MSNBC in total day in the key demo adults 25-54 with 130k vs. MSNBC’s 122k. In weekday prime, CNN topped MSNBC (M-F/8-11 pm) in both total viewers and among the key demographic adults 25-54. For the month, CNN averaged 946k total viewers, a 13% advantage over MSNBC’s 838k, and 294k among adults 25-54, a 20% lead over MSNBC’s 245k. This represents the first time in six months that CNN topped MSNBC in the key demographic adults 25-54 in prime. Compared to December 2009, CNN grew an impressive 52% among adults 25-54 (294k vs. 194k), while MSNBC was up only 14% (245k vs. 214k). At 10 pm, Anderson Cooper 360 had a 52% advantage over MSNBC in total viewers (906k vs. 597k) and a 51% lead in the key demographic adults 25-54 (305k vs. 202k) in January. CNN’s Larry King topped MSNBC’s Rachel Maddow at 9 pm in both total viewers (930k vs.876k) and the key demo 25-54 (264k vs. 233k). And at 8 pm, CNN’s Campbell Brown grew significantly in January, up 43% in total viewers and 73% in 25-54 compared to last month, while Countdown with Keith Olbermann increased only 6%/7% respectively vs. December. Countdown also placed third in January, behind FNC and HLN’s Nancy Grace among adults 25-54. CNN is the only cable news network that provides non-partisan programming representing all points of view in primetime. In the morning (6-9 am), CNN’s American Morning placed second in total viewers, while both CNN and HLN’s Morning Express with Robin Meade outperformed MSNBC’s Morning Joe among adults 25-54 with HLN averaging 166k, CNN posting 152k, and Morning Joe trailing with 100k. During January, CNN reached 118.0 million viewers, FNC had 103.4 million, HLN posted 98.5 million and MSNBC had 91.3 million. As HLN approaches the fifth anniversary of its 2005 revamp to personality-based programming in primetime, it continues to celebrate ratings successes across the board. HLN beat MSNBC in total day in 25-54 (130k to 122k). Morning Express with Robin Meade placed second in 25-54, beating MSNBC’s Morning Joe (166k to100k). Nancy Grace continued its reign as HLN’s highest-rated program, overpowering Countdown with Keith Olbermann in adults 25-54 (283K to 267k). In its fourth month, The Joy Behar Show posted its best monthly deliveries yet among both total viewers (687k) and adults 25-54 (188k). The Joy Behar Show also posted 42% growth among total viewers versus last year (the most growth of any 9 pm cable news show). Miles O'Brien made an appearance on CNN International's 'World Report' on Tuesday. 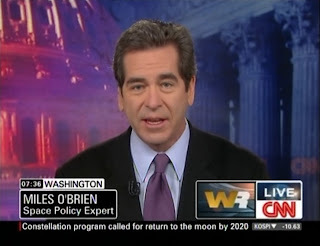 Speaking from CNN's Washington bureau, O'Brien offered up his analysis on President Obama's plan to cut NASA's budget. CNN Observations believes that this was Miles' first appearance on a CNN network since his departure in December, 2008. CNN Press Release - Award-winning producer Geraldine Moriba has been named executive producer of CNN's "In America" unit, the network's newly created division, which will extend the “In America” franchise anchored by Soledad O’Brien. The announcement was made today by Bart Feder, senior vice president for current programming, CNN/U.S. With more than 20 years of journalism experience, Moriba will be responsible for leading the editorial direction of the "In America" unit, working with CNN anchor and special correspondentSoledad O'Brien and a team of producers, generating “In America” series which will run within CNN's weekday programming, as well as long form primetime documentaries. Moriba comes to CNN after 16 years at NBC News, where for 12 years, she served as a producer for Dateline NBC. Most recently she has served as senior producer for Broadcast Standards, monitoring news reports on all NBC News platforms. During this time, Moriba also served as an executive and senior producer on various multiplatform projects including: Obama’s America 2010 with Chris Matthews and Tom Joyner, an MSNBC special town hall on race; About Our Children with Bill Cosby, a two-hour MSNBC special on education; Making Your Vote Count, an election unit covering election fraud and irregularities in the 2008 elections; and the critically acclaimed Father’s Promise with Al Roker and Tiki Barber about the crisis of absent African American fathers. While at Dateline NBC, she produced numerous breaking news reports, as well as an investigative report on a NYC Child Services, various 9-11 stories, and an in-depth report tracing the lives of students in a 1982 fourth grade class photo to determine the impact of crime, poverty and broken homes. While at NBC News, Moriba was appointed a prestigious Visiting Ferris Professorship of Journalism position at Princeton University. During her tenure she developed and taught a seminar on how to use digital journalism skills to get more untold stories on the air. She was also the co-chair for NBC News’ Diversity Committee developing diversity programs to support leadership development and diverse content across NBC News programming. Before joining NBC, Moriba was a researcher at ABC’s PrimeTime Live. She was also a producer for As It Happens, the news and current affairs broadcast of the Canadian Broadcasting Corporation, Radio Canada, covering stories ranging from the LA Riots to the Gulf War. Moriba has won five Emmy Awards, including most recently in September 2009 for Outstanding Coverage for a Breaking News Story Long Form, NBC News Decision 2008 Election Night. She’s won a Peabody Award for a Tom Brokaw special report she produced on the Supreme Court case against the University of Michigan’s affirmative action admissions policy. She has also received an Alfred I. DuPont, the National Association of Black Journalists First Place Award, two New York Association of Black Journalists Documentary Awards, the Radio-Television News Directors Association First Place Unity Diversity Award, the Newswomen’s New York Front Page News Feature Award, the US Films Video Festival Silver Screen Award, two National Headliner Awards, the “Chris” Award of the Columbus International Film and Video Festival, a New York Film Festival Finalist Award and a Nancy Susan Reynolds Informational Documentary Finalist Award. Moriba received her honors bachelor’s degree in Political Science and Women’s Studies from the University of Western Ontario. She is married with two children. The second of four children, Moriba grew up in Toronto, Canada.